Against the backdrop of the #capetownwatercrisis, HOTT3D attended the 2018 Green Event Forum held at Spier wine estate to share knowledge and learn best practice with industry stakeholders on ways to improve event greening. Discussions were held about event greening and how exhibition stand builders in Cape Town can reduce our water usage and dependence on the City Of Cape Towns dwindling water supply. So what is HOTT3D doing to save water? 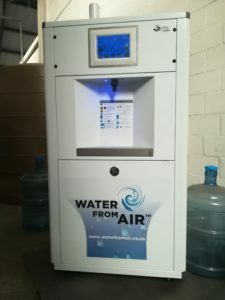 We purchased 2 water from air machines that produce between 50 – 70 litres a day (pictured below). We have actioned certain staff members to collect water from natural streams for toilet use. We have an action plan for the event of Day Zero (Day Zero is a concept given to the actual date that the City of Cape Town will switch off water supply due to dam levels being too low). HOTT3D will supply water to staff members for home use, so that business and production can continue as normally as possible under the drought conditions. At the Green Event Forum, a big emphasis was placed on reducing, reusing, recycling and rethinking materials, to achieve greater sustainability within the exhibition industry – this is a real challenge as exhibitions, by nature, have a heavy carbon footprint. At HOTT3D, a challenge is an opportunity and we have taken the pledge to join the Green Event Forum and encourage other companies in our market space to do the same. HOTT3D strives to responsibly balance the Triple Bottom Line of; People, Planet and Prosperity according to the United Nations Sustainable Development Goals (SDG). We are also committed to business transparently and uphold our values of honesty, integrity and authenticity. How is HOTT3D reaching a reduced carbon footprint? From a sales point of view, we encourage our clients to purchase a stand that is modular and can be used at more than one show to reduce the amount of waste from reproducing an entire exhibition stand for different shows. At the design phase of a project, we try to include biodegradable reusable material as much as possible. The modular approach to stand design and building is top of mind when our design team work because modular elements can be reconfigured and applied to many uses. We rethink the carbon footprint and offset it by adding water-wise plants to stands, creating harmony in the indoor environment. The plants are then cared for at the office – spreading the natural good vibes and reducing stress, as indoor plants are proven to do. Paperless office environment, as far as possible we keep things digital. The production process of stand construction poses the greatest challenge to reducing the carbon footprint we are constantly looking for solutions to recycle the byproducts and waste materials which are the result – recycling our waste at an industrial level is the most viable, cost-effective plan that we are busy working to implement. There is always room to improve and as Nishanti Lambrichs said at the forum, “it is important to measure so that you can manage”. The Green Event Forum provided us with a carbon calculator to use as a tool for measuring the carbon footprint of our business. HOTT3D is deepening our commitment to sustainability and will measure our carbon footprint to more effectively manage our growth and progress to greening the exhibition industry. In conclusion, speaker Deon Robbertze wisely emphasized the importance of progress versus perfection when it comes to sustainability – the important thing is just to start by making manageable changes. You can reassess and improve as your progress, but to expect perfection from the start is unrealistic and likely to cause your company to postpone and inevitably refrain from the sustainable and green business practice.